The Puzzle Museum does not usually concern itself with "Paper & Pencil" puzzles; however we host these web pages because we were the first to recognise the remarkable merits of these puzzles and were largely responsible for making them into an international craze and classic amongst logic puzzles. We did the same thing when we introduced commercial quantities of The Magic Cube, later known as Rubik's Cube, to the Western World in in 1978. We lead and the world follows! Use Logic to reveal the pictures. The picture is made up of solid (black) squares, and blank (dotted) squares. The clues are the numbers at the ends of rows and columns. The numbers are the number of consecutive black squares. Thus a clue 1.9.10 would mean that there is one solid followed by a block of 9 solids followed by a block of 10 solids. The order is correct but you have to work out how many blank spaces there are in between. When you have completed all the rows and columns you will have revealed a picture. Unless you are a Genius always use a pencil so you can rub out mistakes. Always mark the squares you know are empty with a dot. Fill in the solids evenly so the final picture will be clear. Cross out the clue numbers as you complete them. The Sunday Telegraph was the first paper in the world to realise the potential of this kind of puzzle and has been publishing them continuously since 1990 - longer than anyone else. 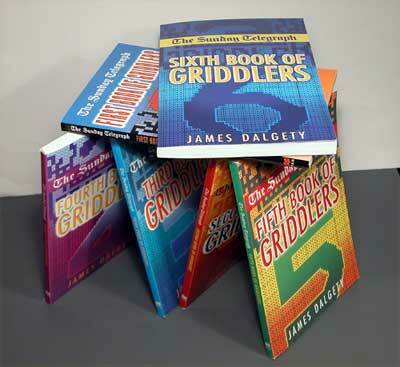 Nine Sunday Telegraph Books of Griddlers are available from any good bookshop.